Last weekend, I was happy to join nearly two dozen amazing women and their families at the Moms As Entrepreneurs Spring Mega Expo at Morgan State University. Moms As Entrepreneurs (MAE) is Baltimore’s only entrepreneur training program specifically geared toward moms. Since MAE’s founding in 2016, participants have launched more than 100 mom-owned businesses, helping increase families income by more than 50 percent. As a mom and a former business co-owner, I know the difficulties of balancing family time with day-to-day operations. There are plenty of challenges to starting a business, but thanks to programs like MAE, those challenges can become a little easier. Not only does MAE provide hands-on training sessions and a curriculum focused on business action plans and financial education, but the organization provides a strong support network for women looking to start sustainable businesses and support their families. The 23 moms included in last weekend’s expo represent a wide range of businesses – from custom handbags and hand-poured candles, to event management and after-school youth programs. I was truly inspired by their fierce determination to launch their products and services in front of the Baltimore business community. Congratulations to all of these impressive women on what they’ve accomplished. 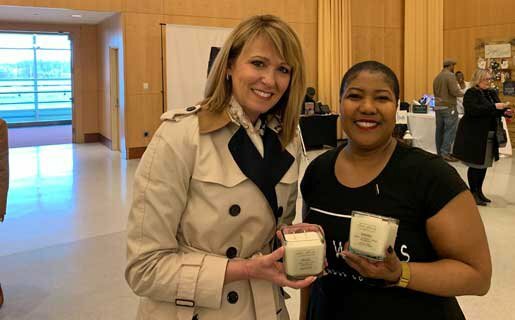 Maryland Commerce Secretary Kelly Schulz with Gail Harris, mom-entrepreneur and owner of Cozy Wicks Candle Co in Owings Mills. Thank you to founders Dr. Tammira Lucas and Jasmine Simms for their hard work and dedication to the local entrepreneurial community. With programs like these, it’s no surprise that Maryland ranks second among the states for women-owned businesses, and Baltimore City has been named the top American city for women in business two years in a row. We are very lucky to have MAE’s programs available to moms throughout Maryland. 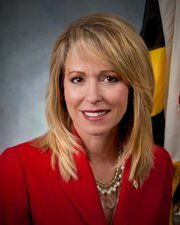 Please remember that the Maryland Department of Commerce is here to help support up-and-coming entrepreneurs and small businesses along the way—let us know if you’re looking for workforce training, exporting assistance, or funding resources to help grow your business in Maryland and overseas. The Moms As Entrepreneurs Spring Mega Expo is a partnership between the Morgan State University Entrepreneurial Development & Assistance Center, Open Works Baltimore, and Baltimore Etsy Sellers. Learn more about MAE at maeentrepreneur.com.